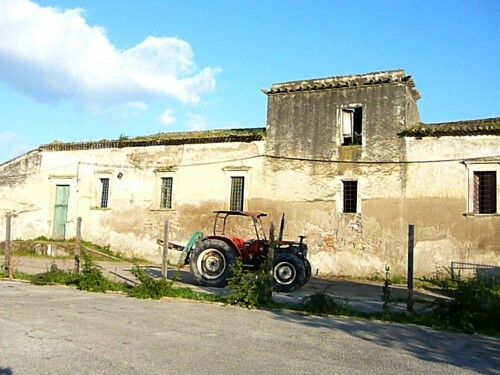 Down a tight road, through a narrow gate, no people, no cars, seemingly abandoned farm buildings, an old red tractor, no animals in sight, but the smell of hay and dung hung in the warm early evening air near Spezzano Albanese, in the arch of the Italian boot. Not a promising start after assurances that we would find the best mozzarella di bufala in the world or, at least, in Italy or, for sure, in Calabria. We enter into a tiny space, the store, empty of any products. A man looks up from the adjoining larger room where he is washing down the white-tiled walls and cream-tiled floor with a hose. His name is Mariano. If we can wait, he will have the mozzarella made fresh in twenty minutes. Why don’t we visit the water buffalos? Across the cracked pavement of the empty parking lot and around the corner of of the huge abandoned building we find about twenty water buffalos munching on their supper of hay. Communing with buffalos is only interesting for five minutes or so and we couldn’t discern where the milking shed might be and we weren’t as happy as the buffalos with the swampy mud. So we headed back to the caseificio to watch the mozzarella being made. Maddalena and Florina had joined Mariano. A round stainless steel vat of water was heating on one side of the room. On a stainless steel table were loaves of porous cheese curd made from milk obtained from the water buffalos during their morning milking. Mariano carved off a large piece of the curd, placed it in a large round metal pan and crumbled it into small pieces. He added scoops of hot water and stirred the melting crumbs with a wooden stick into a smooth mass. 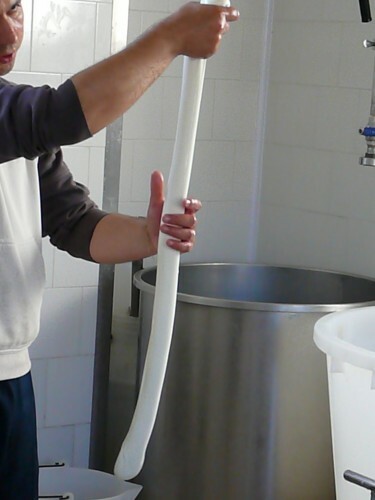 This is called “stringing the curd.” After the desired elasticity was achieved, Mariano scooped off the excess water. From the large mass of mozzarella, they used the plastic scoop and the wooden stick to cut off baseball-sized pieces and dumped them into a rectangular bath of warm water where Maddalena and Florina formed them into balls of mozzarella di bufula. Each loaf of cheese made about twenty balls, which then went in to a salted bath to cool. We asked for a large braid (treccia) of mozzarella and Mariano carved off a huge hunk of the smooth elastic mass. He warmed it by dipping it into the hot water bath. Then he held it high and let it stretch. He dipped the long piece into the warm water again and then let it stretch even more. Folding it over at the center he began to twine the treccia into its classic form. 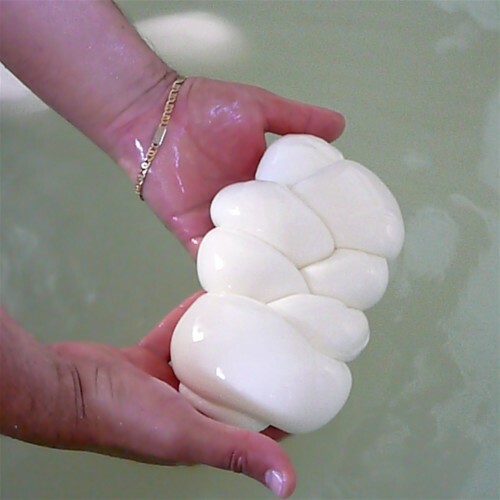 Usually fresh mozzarella spends a few hours in a bath of cold salt water. We took our order (2 kilos (about 4.5 pounds)) with us, each ball or braid bouncing around in salted water inside tied-off plastic sacks. Before we left we each got a taste of warm unsalted mozzarella – an intense milky flavor with essence of the air around the Caseificio Torre Mordillo. Food historians still argue over the genesis of mozzarella di bufala in Italy. One theory is that Asian water buffalo were brought to Italy by Goths during the migrations of the early medieval period. Some say that Arabs brought water buffalo into Sicily and later, the Normans brought them to the mainland. Water buffalo were a familiar sight in the swampy coastal countryside of medieval Italy. They were widely used as draught animals in plowing compact and watery terrains, both because of its strength and the size of its hooves, which do not sink too deeply into moist soils. Production in and around Naples was briefly interrupted during World War II, when retreating Nazis slaughtered the area’s water buffalo herds. The farms were restocked a few years after the armistice was signed and the mozzarella has been growing ever since. Twenty percent of today’s Italian mozzarella di bufala output is shipped to France and an equal amount makes it overnight to the United States. 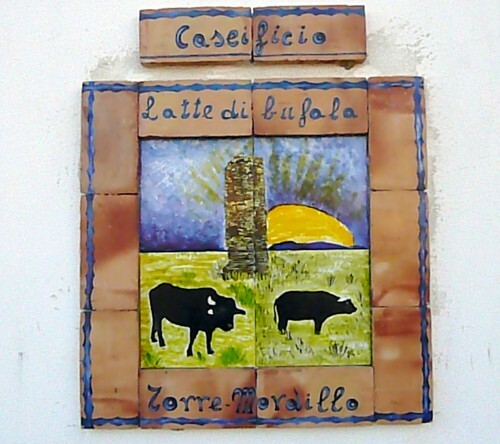 In early 2010, a scandal erupted over allegations that as much as a quarter of cheese sold as mozzarella di bufala contained cow’s milk rather than water buffalo milk. 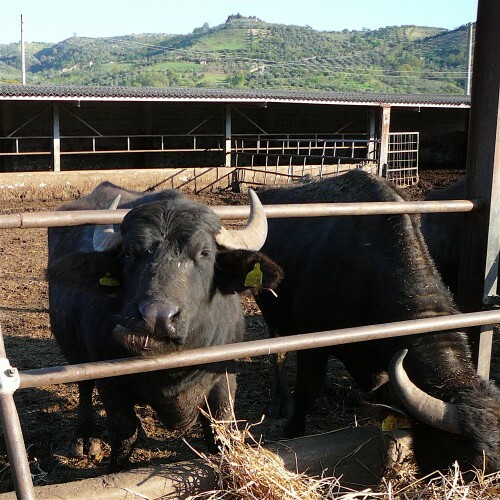 It is widely known that the best and most highly prized artisanal produced buffalo mozzarella is still found south of Naples near Battipaglia and Caserta where small factories continue centuries-old traditions making buffalo mozzarella fresh daily for their local customers, who travel for miles to buy it only a few hours after the morning milking. Obika, the mozzarella bar/restaurant with locations in London, New York and throughout Italy goes to the Campania region for all of the fresh mozzarella di bufala served in each of its unique bars. There are two basic ways to make mozzarella: direct acidification of the milk to form the curds or the culture/rennet method. In both methods, raw milk is pasteurized and then coagulated to form curds. Once the curds reach a pH of 5.2 they are cut into small pieces and mixed with hot water and then “strung” or “spun” until long ropes of cheese form. This “stringing of the curd” is unique to cheeses in the “pasta filata” family, such as mozzarella, scamorza and provolone. When the proper smooth, elastic consistency is reached, the curds are formed by machine or hand into balls which are then tossed into cold water so that they maintain their shapes while they cool. They are then salted and packaged. 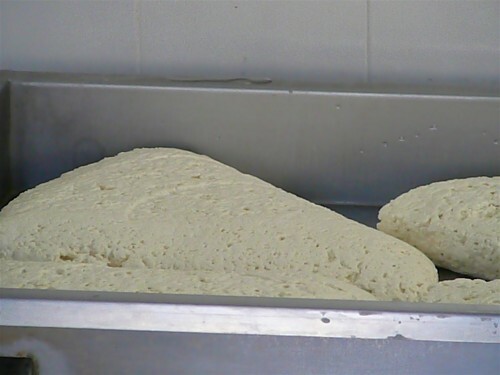 It is a short making process, usually less than 8 hours from raw milk to finished cheese. The critical moment is determining exactly when the cheese is mature and ready to be strung…waiting too long can result in a mushy cheese, while stringing too early can result in a tough dry cheese. Once strung, the curds can be formed into balls of varying sizes: Ovolini (egg size) 4 ounce balls; Bocconcini (bite size) 1.50 ounce balls; Ciliegine (little cherry size) .33 ounce balls. My favorites are the braids (treccia) of mozzarella or, even better, burrata, which is like a mozzarella truffle – a ‘skin’ of mozzarella surrounding cheesy “rags” and cream. Mozzarella di bufala can be smoked, either in a smoking chamber or by “painting” with a liquid smoke, but a little affumicata can go a long way so use sparingly with a spicy side dish or in bits on a pizza with eggplant. Herbs and sun dried tomato bits can be added. There are many possibilities, but just fresh and plain is always best. Mozzarella di Bufala is the ultimate mozzarella tasting experience – everyone remembers their first time. Buffalo mozzarella should taste fresh and reminiscent of cream. Tasted the same day it is made, it will leave a lingering pleasant musky aftertaste – perhaps of hay. It should be mild and delicate, but creamier than cow’s milk mozzarella. There should be a hint of sourness and salt. (If it tastes too tart or sour the cheese is past its prime.) The color should be white; however, seasonally the cheese can be more yellow due to the cows’ diet of grasses. The fresher the cheese, the more elastic and springy the curd, but it shouldn’t be rubbery. Once you have tried fresh mozzarella di bufala it is almost impossible to go back to regular mozzarella, or any other cheese. 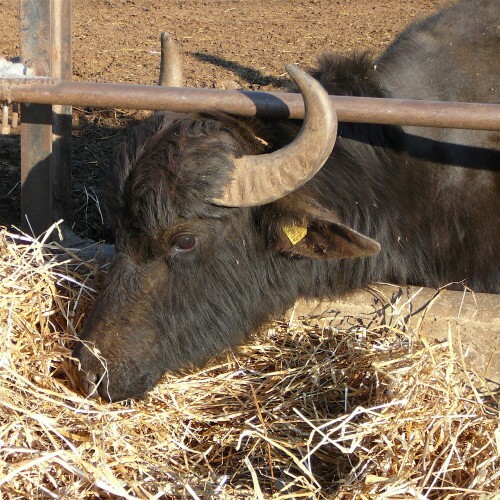 View a video of Antonio Palmieri’s organic water buffalo farm where happy buffalo make delicious mozzarella.